The Hurricane Sandy splashed water over the Google’s Android which was bound to happen on 29th October where they were to announce some new Nexus devices along with a new version of Android. Google had to cancel the event but they went ahead with a casual announcement. They announced the Google LG Nexus 4 smartphone, Google Samsung Nexus 10 and Google Asus Nexus 7 3G. All of these devices will come pre-installed with improved version of Android 4.2 which will still be called as Jelly Bean. Android 4.2 will also be available for current Nexus 7 and Samsung Galaxy Nexus devices but it is not yet confirmed for a 2-year older Nexus S. The Nexus 4 price in India is not known yet but it is available unlocked from Google Play Store starting from just $299 for the 8 GB version and $349 for the 16 GB version which is really a huge bang for the buck considering its rival flooring performance. The Nexus 10 is available for $399 and $499 for 16 GB and 32 GB versions. The Nexus 7 3G is available in the 32 GB version for $299 from the Google Play Store. 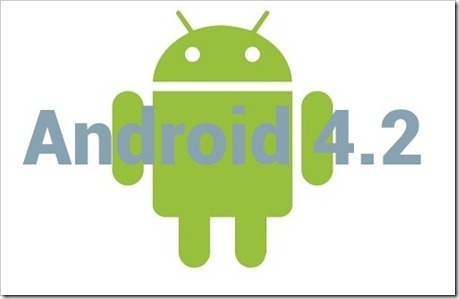 Android 4.2 is an improved or you can say, refined version of Android 4.1.2 JellyBean. 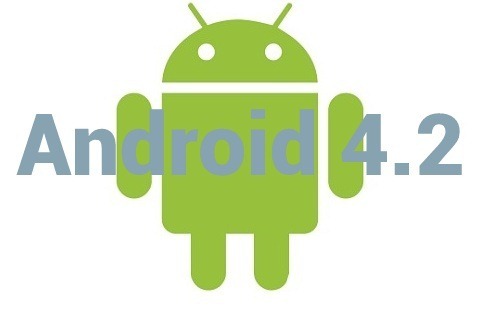 Android 4.2 should ideally answer the questions raised to Android by rival platforms such as Apple iOS 6 and Microsoft Windows Phone 8. Google introduced us to the Panorama feature in the 4.0 ICS and the new Photo Sphere is an extension of that with a huge inspiration of how Google Street View works. Now you can click the entire surroundings in 360 degree view as opposed to Panorama where you can stitch images only in horizontal way. This is a more fun and complete way to store the surroundings. After clicking these photo spheres, you can browse them in a 3D interactive way. 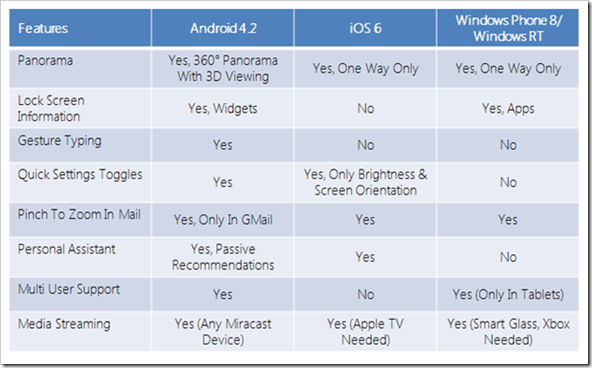 Android is now one step ahead of both iOS 6 and Windows Phone 8 as both have only one way Panorama and not the 360 mode. This is one of the most exciting features of Android 4.2 as you can set widgets on your lock screen too! You can have glance-able information such as mails, stocks or news right on your screen without a need to unlock it. If you want to use that particular app, you must unlock the screen. Also, now you can go to camera mode even if you have a pass code lock. Windows Phone 8 can display information such as unread mails count, match scores, etc. on the lock screen. Some of the parts of the tablet UI are now inspired from phone UI such as multitasking menu; Android buttons are now in the middle of the bottom bar rather than being on the left bottom corner. Also the notifications bar can now be swiped down from the top rather than being at right bottom corner which is similar to the Nexus 7. Now the tablet UI feels a lot refined as opposed to earlier where you needed to reach every corner of the screen for different tasks. Right! This is very similar to the Swype Keyboard that we all love or hate. Now you can just swipe over the letters in a word instead of typing each key independently. The word suggestion while using gesture keyboard changes constantly in line with your finger movements. If you don’t like this mode, you can use the normal typing method in the same interface. You don’t get any additional features in the iOS 6 but Windows Phone 8 offers next word suggestions. Now you can bring down down the notifications bar by swiping with two fingers to reveal the quick settings toggles such as Wi-Fi, Bluetooth, Screen Brightness, Airplane Mode and Battery Status. This is one of the best improvements in the ease of use in Android. Quick Settings toggles are as many provided in Android are not available in any of the rival smartphone/tablet platforms but iOS 6 has quick toggles for screen brightness and screen orientation. Available from Jelly Bean 4.1, but now you can view expandable and actionable notifications from more apps such as E-Mail, Calendar and more. For example, you can now expand and accept calendar invitations from the notification bar itself without opening the calendar. Neither iOS 6 nor Windows Phone 8 provides actionable notifications. It took a lot of time for Google to introduce pinch to zoom, swipe to delete or archive features into their hugely popular Gmail application. It was present in rival platforms since ages. Although not much useful, you can browse and discover music albums and artists. We don’t think it will be used much by consumers as the music store in Google Play Store is not available in a lot of countries. It was bound to happen as Google prepares to improve its passive personal assistant rivaling Apple’s Siri. Now you can open apps from Google Now and get recommendations for nearby attractions and photo spots. It can also pick up data from your Gmail such as hotel reservation and flight ticket confirmations and display them on the particular date. Now Siri has some tough competition. A lot of households have a single tablet and it is very practical to have multi-user support. Now you can create multiple accounts and all the preferences, applications and screen arrangement will be as per customized by the account holder. Even the apps and games will start fresh with personal data and game scores. But as a patent for this in mobile phones is patented by Nokia, it is not available to Android phones. This feature is already available in Windows RT based tablets but not in Apple iPad or iPhone. This technology is an open standard rival to Apple’s Airplay and is based upon Wi-Fi 802.11n protocol. You can stream content from your Android 4.2 based smartphone or tablet to your HD TV (direct/set-top box/Blu-ray Player if they support it). Google says that Miracast boxes will be available by next quarter at cheap prices below $99. All the TV manufacturers such as LG are abiding by that protocol already. As opposed to the open standard used by Android, Apple uses their proprietary Air Play which needs Apple TV while Windows Phone 8 uses ‘Smart Glass’ technology which needs Xbox for it to work. Nothing exciting here but this new clock finally comes with built-in world clock, timer and stop watch functions. Helpful in viewing photos or news onto the device screen when it’s in the sleep mode which will be helpful when it is in a docking mode. 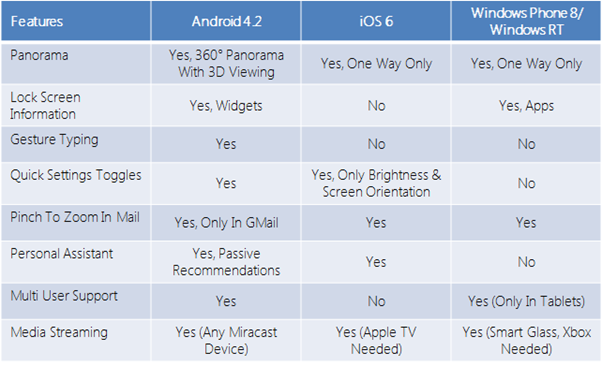 Android is now on par with other platforms in features and in some ways it is two steps ahead of them. This incremental update finishes off any threats that recent Windows Phone 8 posed with its lock screen data, smart glass and new camera interface. Multiuser support in Android 4.2 is also for Tablets only. You need to update the table above.